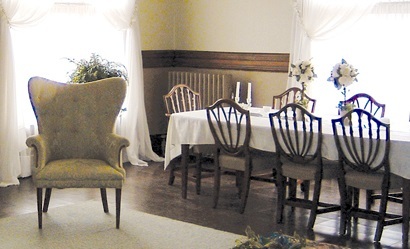 Upstairs Tea Room. Often the location of the monthly Board Meetings. In 1961, the Muskegon Woman's Club and the Muskegon Heights Woman's Club merged to form the Greater Muskegon Woman's Club. The following members graciously donated their time and talents to the Greater Muskegon Woman's Club after the merger of the two clubs. Those who served prior to the merger are not listed, but are greatly appreciated and fondly remembered for their contributions to the two original clubs and are listed in the Greater Muskegon Woman's Club's archives.